I thought I'd post some design notes for the curious who want to know what I do when I'm not drawing, reading, or writing. I'm hoping to start a new series featuring a revamp of my old Angel of the Month series that got started, but never finished. 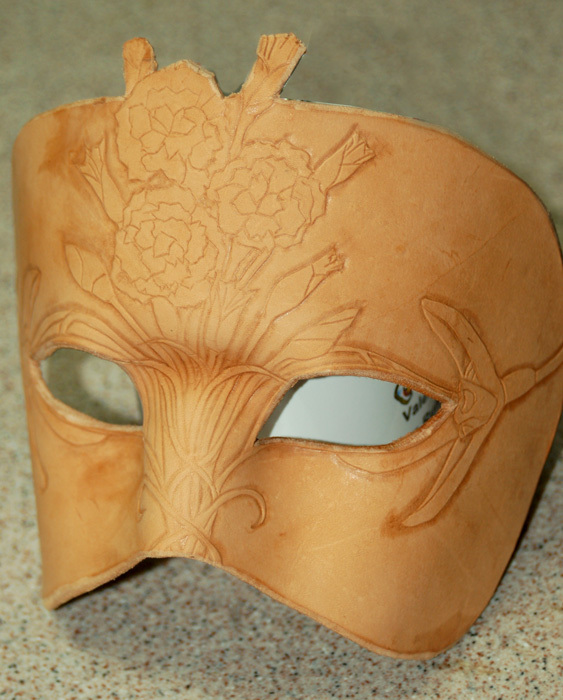 What better way to get in the mood than to do a mask inspired by similar themes? Like most of my paintings and writings, mask-making begins with a little research. Nothing gets my muse tingling more than lore of the land! January may seem like a boring uneventful time, but the lore of the month is fraught with interesting imagery. Named for Janus, the Roman god of beginnings, endings and gateways, January is a time of hope, purification and the promise of a new beginning. The birthstone for January is the Garnet, which can be found in clusters and is often equated to pomegranate seeds which are in turn associated with the damnation of Persephone to the Underworld. The grasp of Hades is coming to an end as January begins and Persephone awaits her time in the sun, ushering in the Spring. January's flowers are the Carnation and Snowdrop in western cultures. Carnations, while seen as a generic flower of affection and reunion in florist shops, have a darker meaning in Mexican Indian culture, where they are 'flowers of the dead' piled around the bodies of the recently deceased before they are buried. In Korean lore, three carnations were used to divine which phase of an individual's life would contain suffering and hardship by watching to see which flower would wither first upon being placed on the forehead. The Snowdrop's habit of popping up through the snow in graveyards became a portent of death and ill fortune to the Victorians. Informed by the themes of January's lore, I worked out a few thumbnails to get a basic idea of the shape and flow I wanted in the mask. The 1st one was the most ambitious featuring piles of flowers at the edges. Too busy, however (and a little evil-looking)! The 2nd had a nice contrast between details and texture, but it didn't feature the Snowdrop element as much as I wanted. The third seemed the best balance of the Snowdrops at the side of the eyes, the Carnations in the middle and a graceful compositional flow from the center outward and into the eyes and brow. Next came drawing the pattern onto printer paper, transferring to leather, a cup of coffee, tooling and carving with chisels and burnishers, and finally shaping and baking the leather! If you want to learn more about the specifics of the process, I learned from the best, Andrea Masse, Brenda Lyons, and my own experimentation. After some careful painting with acrylics and a few layers of satin varnish, the final product emerges! It came out rather Christmas-like, but that feels somehow fitting for this type of moody January. For more crafts from me, check out my artisan account on DeviantART.